The Trans Star is a 20-passenger, dual rear-wheel bus that combines signature aerodynamics with the Ford Transit platform. WARWICK, N.Y. — Trans Tech announced on Monday that it will unveil the newest edition to its Type A school bus lineup at the NAPT trade show. 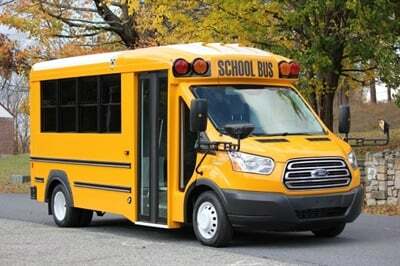 The Trans Star, which will be available in 2017, is a 20-passenger, dual rear-wheel school bus that features Trans Tech’s signature aerodynamic design, according to the manufacturer. Trans Star is built on the Ford Transit chassis and includes safety features such as Trans Tech’s heavy-duty, pan-formed floors. Bob Ramsdell, the chief safety officer for the school bus contractor, will serve on the Transportation Security Administration's Surface Transportation Security Advisory Committee. The fleet tracking solution provider, which created the Here Comes the Bus tracking app, expects its acquisition by CalAmp to accelerate growth. Chris Hiebert, the former director of operations at Collins Bus Corp., has been with the school bus manufacturer since 2003, working in various roles. Loading and unloading procedures and communication were some of the topics covered at the California Association of School Transportation Officials' annual conference in Anaheim. Matt Scheuler will lead all sales and strategic planning across REV Group bus companies based in Kansas and Michigan. Take a look at some of the speakers and sessions at the California Association of School Transportation Officials' annual conference. There was even a special appointment of school bus "royalty." Although school buses are the safest form of transportation for students, it is heartening to see more attention being paid to keeping an extra eye on safety — for both students and drivers. The dog boards a Texas school bus, refuses to get off, and police take him to a shelter. Meanwhile, a goat makes a couple attempts to climb into a Utah school bus.